The perfect combination of multi colors giving a very jewel kind look in this carpet. 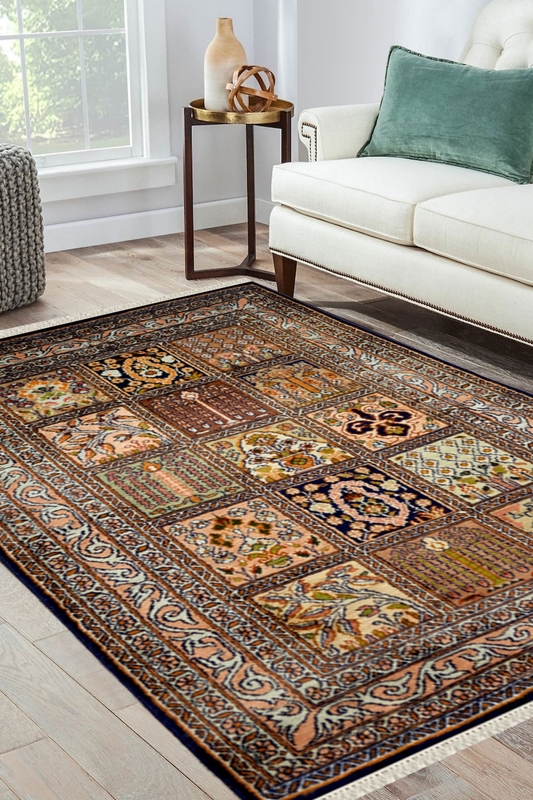 It has a very intricate Hamadan design pattern which is handcrafted by our artisans. This is suitable for living area and as well as you can use it for the wall hanging. This pattern is influenced by Hamadan design pattern and is originated from Iran. It is typically Kashmiri pattern in Hamadan design with muted color. The yarn in pure silk which is produced in China. Chinese silk is the finest quality of silk yarn. The warp is in cotton and weft is in pure silk. We absolutely love the tiny tinge of blue, Ivory, green that stands out in this carpet. This carpet is 100% handcrafted by our skilled craftsmen. Kashmir silk carpet is very decorative and durable. Number of Knots in this rug are 326 knots per square inch. It has taken approximately 3-4 months to weave.